1. How do I achieve LOW temperature with capillary-mounted samples? An Oxford Cryosystems Cryostream Plus can be used in conjunction with capillary-mounted samples to achieve temperatures between 80 - 480 K.
2. Can I cool samples to 10K? A He-flow cryostat capable of achieving temperatures between 10 - 300 K is available. The samples will be mounted in flat transmission geometry and the design will allow three samples to be loaded into the holder at once. Information on sample preparation can be found here. Figure 1. Cryostat with samples mounted in flat transmission geometry. 3. How do I achieve HIGH temperature? A Cyberstar hot-air blower can be used in conjunction with capillary-mounted samples to achieve temperatures between 350 - 1270 K.
A Stoe capillary furnace (Figure 3) can heat capillaries up to 1770K. Quartz capillaries can be used up to 1370K, above which sapphire capillaries must be used. Users must supply their own sapphire capillaries. An Anton Paar furnace (Figure 3a) can be used to heat flat plate samples to 1870 K, using a Pt filament (Figure 3b). Purchasing directly from Anton Paar and requesting a quotation through their website. A link to the website can be found here. 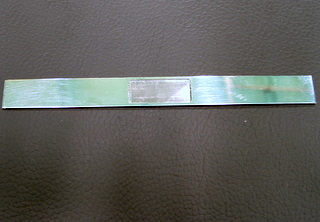 These strips are supplied with thermocouples attached and please use the part numbers shown below. Locally by XRF Scientific using the dimensions as shown below. XRF Scientific is a diverse company, so please put 'Attention Mr. Gino Manfredi" in your query on their web page. If you wish to use a cavity, then you will need to make separate arrangements as XRF Scientific do not machine the cavity. The cavity in the Pt strip is 0.2 mm deep and is approximately 20 mm (L) x 8 mm (W) located in the centre of the strip (Figure 3b). S-type (0.35 mm diameter) thermocouple wire will need to be purchased separately. These can be also purchased through XRF Scientific. Please contact beamline staff if you have any further questions. It is possible to recycle used Pt strips through XRF Scientific with additional charges for refining, metal replacement and fabrication. XRF Scientific do not have the capability to put in a cavity, so this should be machined elsewhere. S-type (0.35 mm diameter) thermocouple wire will need to be purchased for recycled strips which also can be purchased through XRF Scientific. 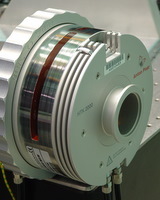 Staff at the beamline are able to attach the thermocouples to your strips. The beamline does not supply thermocouple wire. The Anton Paar domed heating stage (DHS1100) can be used to heat flat plate samples from ambient temperature to 1100 °C in a variety of inert gas atmospheres or under vacuum. Solid compact, thin film and powder samples can be used in the furnace. The furnace is able to oscillate, giving markedly improved powder averaging compared to the HTK2000, however sample preparation is important for obtaining high quality results. Solid compact and thin film samples can be directly placed on the aluminium nitride heating plate and held in place with Inconel spring clips. Sample dimensions should be no larger than 20 mm in diameter and 1 mm thick (see Figure below). Sample thickness should be as small as possible due to temperature gradients from the heated bottom of the sample through to the top where the diffraction data is obtained. Powder samples are mounted in special, circular Inconel sample holders that are 20 mm in diameter and have a well depth of 1 mm. 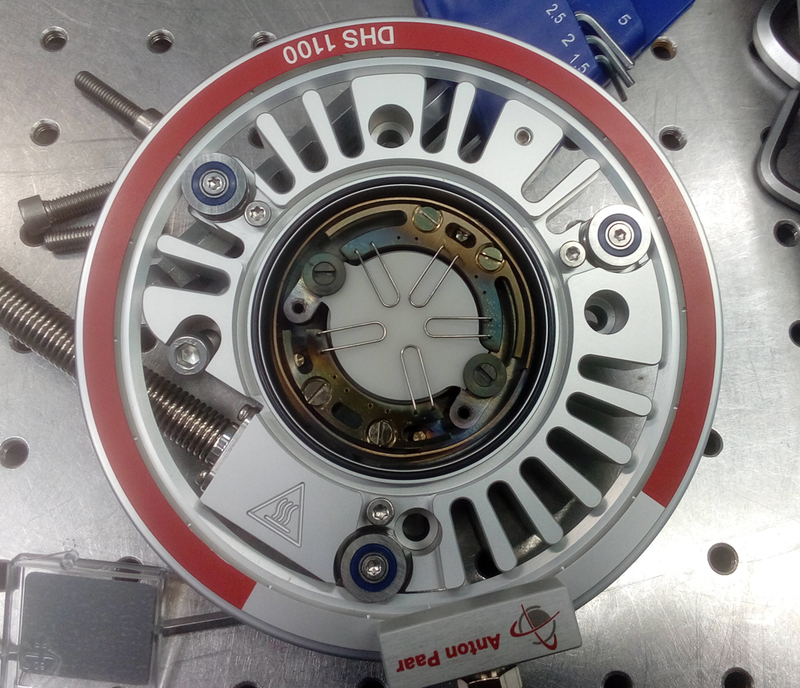 The powder sample holders are supplied by the beamline and are re-usable. Although Inconel is resistant to oxidation, and is relatively stable at high-temperatures, it is possible that samples may react with the sample holder. 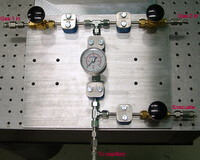 Due to variable sample thicknesses and thermal properties it is recommended that experimental teams carry out their own calibration during beamtime. Adequate time (approximately 4 hours) should be allocated in beam time proposals for the calibration. An adapter for collecting the temperature calibration will be provided. 3c. The DHS1100 furnace showing the sample position. The sample/sample holder is held in place with clips. 3d. The furnace with dome in place on the diffractometer at PD. 3e. DHS1100 powder sample holders. These are 20 mm in diameter and 1 mm deep. 4. Is it possible to do high-pressure experiments? High-pressure (greater than 1 GPa) apparatus is available. 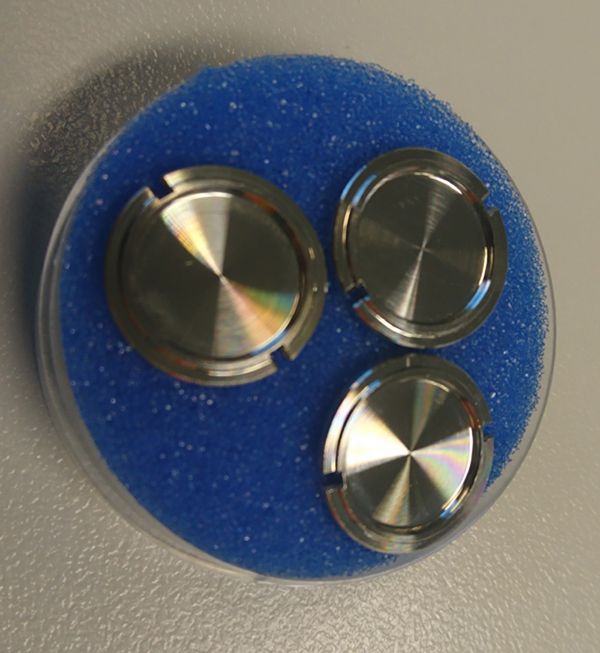 Our diamond anvil cells (Figure 4) can currently only be used at ambient temperature. For experiments where pressures exceed 10 GPa, Users will need to supply their own diamonds and WC seats. They can be purchased from: https://www.diamondanvils.com/ or http://www.almax-industries.com/. Users must consult beamline staff for more information before purchasing, as a number of parameters need to be determined to enable the appropriate diamonds to be acquired. As Users are required to supply their own diamonds for experiments that exceed 10 GPa, the maximum pressure available is at Users own risk. 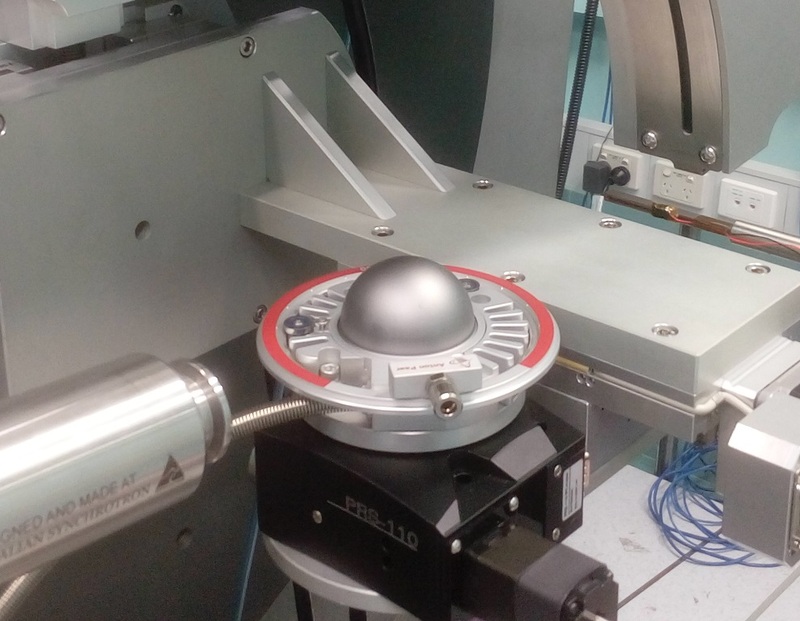 The beamline set-up, sample preparation, alignment and data collection is not trivial and is quite time-consuming. It is recommended that Users without high-pressure sample environment experience contact beamline staff if interested in submitting a high-pressure proposal. 5. Can I do high pressure / gas flow experiments using capillaries? Yes, there is a flow cell available; it may be used to either evacuate a capillary, maintain a constant pressure or flow gas(es) during data acquisition. The flow cell is shown in Figure 5 and the gas manifold is shown in Figure 6. For all high pressure capillary experiments using either the Norby or flow cell, the maximum pressure allowed is 2 MPa (20 bar). Higher pressures are possible only by prior agreement with beamline staff, however sapphire capillaries will be required. It is mandatory that thick walled quartz capillaries are used for all high pressure capillary experiments, especially for those that require heating. Pressures of 5 – 10 bar require capillaries with a wall thickness of at least 0.02 mm. 10 – 20 bar experiments require capillaries with a wall thickness of at least 0.05 mm. These can be specially ordered from Hilgenberg. 6. What are the maximum temperatures and pressures that hydrogen gas and hydrogen gas mixtures can be used in capillary and flow cell experiments? For all Norby and flow cell experiments the maximum pressure allowed is 20 bar. For pure H2 gas or hydrogen gas mixtures >5% H2, the maximum heating temperature permitted is 500°C. For all other non-combustible gases, the maximum temperature is 1000°C. Please note that for any flammable gas, at any pressure, flowing or static, there must always be 2 persons present at the beamline to monitor the capillary and ensure that breakages are detected as soon as they occur. 7. Can I use pure CARBON MONOXIDE (CO) gas or gas mixtures containing CO? Carbon monoxide (CO) is a highly toxic gas (see the safety information below). For this reason we will not permit pure CO gas, gas mixtures containing CO or experiments that generate CO gas at the beamline. Although monitoring is possible, the main issue is that the beamline gas handling and extraction systems are not at a sufficient standard to handle an emergency release. "Carbon monoxide is colourless, odorless, and tasteless, but highly toxic. It combines with hemoglobin to produce carboxyhemoglobin, which usurps the space in hemoglobin that normally carries oxygen, but is ineffective for delivering oxygen to bodily tissues. Concentrations as low as 667 ppm may cause up to 50% of the body's hemoglobin to convert to carboxyhemoglobin." "...levels of 50% carboxyhemoglobin may result in seizure, coma, and fatality." "Within short time scales, carbon monoxide absorption is cumulative, since the half-life is about 5 hours in fresh air."